Malaysia has launched express immigration lanes for Southeast Asian citizens to facilitate their travel to and from the country ahead of its assumption of the ASEAN chair next month, a government official said Friday. 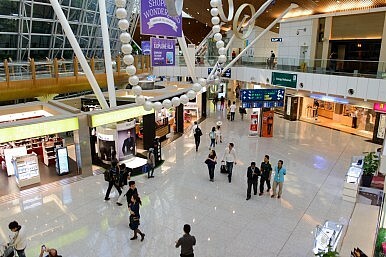 Mustafa Ibrahim, the director general of the Immigration Department, told reporters that Malaysia had set up five lanes within the Kuala Lumpur International Airport (KLIA) – two at the departure gate and three at the arrival gate – and four lanes in Kuala Lumpur International Airport 2. Mustafa said the so-called “ASEAN lane” – which has been in the works for a while – would be on a pilot basis for now but is expected to be fully launched by February. By then, Malaysia’s aim is to provide the service at other airports in the country as well, including those at Kota Kinabalu, Kuching, Langkawi and Penang. The “ASEAN lane” would ease travel significantly for ASEAN passport holders to Malaysia, who account for around a fifth of all travelers to the country, according to Mustafa. The initiative also comes just under two weeks before Malaysia will officially assume the chairmanship of ASEAN on January 1, 2015, which will be a key year for regional community-building with deadline for the establishment of the ASEAN Economic Community on December 31. “This is one of Malaysia’s way to champion and enter a new era of ASEAN community when Malaysia assumes the chairmanship…We are ready to take cooperation within ASEAN to a new level,” Shahrul Ikram, the ASEAN-Malaysia National Secretariat director general, said at an ASEAN exhibition booth last month. The ASEAN lane is also in line with Malaysian prime minister Najib Razak’s vision to create a more “people-centered” ASEAN, which is expected to guide the country’s chairmanship next year. “Acceptance by the people must be the basis of whatever we do and they must be able to feel the significance and relevance of ASEAN and what benefits they get from it, for example the creation of an ASEAN community,” Najib told Malaysian reporters after attending the opening of the 25th ASEAN Summit in Myanmar last month. ASEAN insiders have long been calling for the establishment of the “ASEAN lane” in all ten member states as a tangible way for Southeast Asian citizens to directly benefit from regionalism, which could in turn help boost low levels of awareness about the ASEAN integration project. The lack of awareness of ASEAN is a severe problem even in Malaysia, which was one of the five original founding members of ASEAN. According to a recent survey commissioned by the ASEAN Secretariat, Malaysians have the lowest level of awareness of ASEAN amongst all ten Southeast Asian countries. Munir Majid, chairman of the ASEAN-Business Advisory Council, praised the Malaysian government for pursuing the move earlier this month and urged other Southeast Asian countries to do the same. “The Malaysian government is to be congratulated for – at least – implementing next year an ASEAN lane for immigration queues at airports. Others, almost all other ASEAN states, should also take this simple step,” Munir wrote in a column for The Star on December 6. An ASEAN Giant Mulls the Region’s FutureCan ASEAN Economic Integration Succeed?What is the Future of Integration and Inequality in ASEAN?How Nationalism Undermines ASEAN IntegrationAs the World Turns Away From Globalization, How Should ASEAN Respond?